Discover Northern Michigan Beachtowns ... "Gods Country." The perfect fit for the term "Gods Country". Empire is one of my favorite Northern Michigan beachtowns. Northern Michigan beachtowns offer everything to satisfy your every want and yet they give you the option to visit beautiful forests, isolated beaches and romantic islands. The Northwest area along with Grand Traverse Bay, and Little Traverse Bay is home to some of the most charming Michigan beach towns in the state. Just zoom in and around on the map below and you'll understand the majestic beauty that is here for your enjoyment. Tell Us about your favorite northern Michigan beach town. This is one of my favorite photo's of Sue. 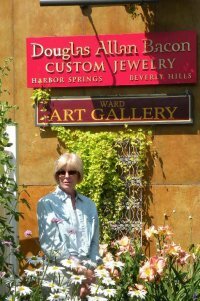 She loves visiting the art gallery's in downtown Harbor Springs. We always end up dining on Little Traverse Bay at Staffords. They have a great dockside dining area with great views. It's always fun watching the boats coming and going. Staffords is also a great place for a sunset dinner or enjoying a glass of locally produced wine. Their menu is always centered around locally grown products and they offer some tasty Perch and Whitefish dishes. These northern areas are also home to many of the charming Michigan wineries. You'll need several days to really visit and enjoy the tasting and wine events they offer. Wineries are hosting more year round events so be sure to visit our winery pages! Several microbreweries can be found in the Traverse City area and nearby communities. It seems there are almost as many brewery's as there are wineries. Oh well, just that much more tasting to enjoy! These brewers have taken beer to a whole new and fun level. Take your time, enjoy the scenic drives, be in awe of giant dunes, explore the Northern Michigan beachtowns in ... "Gods Country". Like all Michigan beachtowns they are busiest in the summer months with festivals and events to enjoy. However fall drives and wintertime fun also make for romantic getaway enjoyment. Some of the best cross country and downhill sking in the U.S. can be enjoyed in northern Michigan. Another thing I've discovered is that the restaurants in Northern Michigan beachtowns offer the tastiest Lake Michigan perch and whitefish you'll ever experience. Gotta a sweet tooth? You'll find plenty of fudge. This sweet is so popular many towns have fudge shops where you can sample and watch it being made daily. If you're like me ... I can't resist. A beautiful setting on the Little Traverse Bay. You'll enjoy strolling along the beach in search of Petoskey stones - the state stone. Many of the shops will have them polished and made into jewelery. This is such a charming town it has always been one of my favs. Harbor Springs is located close by and is a must stop if you are in the area. This area was also the setting for Ernest Hemmingway's "Nick Adams" stories. This enchanting little town is nestled between Lake Michigan and Lake Charlevoix. This is the home of the Beaver Island ferry. 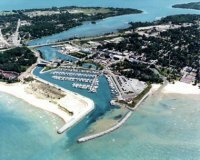 A trip to Beaver Island should be a part of your plans when you visit here. It's close to Sleeping Bear Dunes National Park and the famous Boyne City and Boyne Falls ski lodges. Hosting a Venetian Festival, Apple Festival, and a Waterfront Art Fair be sure and mark your calendar to enjoy these events. Another area where Ernest Hemmingway spent boyhood summers. 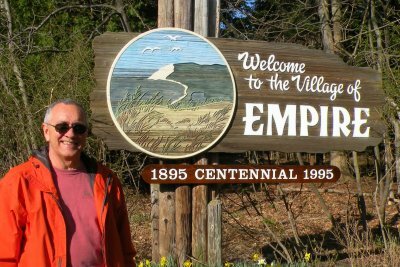 This charming town has East Traverse Bay on it's west side and beautiful Elk Lake on the east side. Park and walk to quaint shops and wonderful dining. Great shopping, beaches and biking. You can come in by boat from Lake Michigan or Grand Traverse Bay. Located between the "Tuscany like country side" of Leelanau and Old Mission Peninsulas, it is the 2nd most popular destination in Michigan. Noted as the "cherry capital" of the world, they host the annual Cherry Festival the first week in July. Plan on taking the time to enjoy all the little towns and villages on these scenic peninsulas. Suttons Bay describes itself as a year'round coastal village on the Leelanau Peninsula. A beautiful little town and a must visit for an incredible day trip or more. I know I always say "it's my favorite" but this one really is! 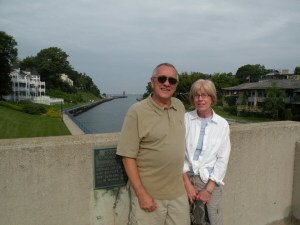 North of Ludington where the Manistee river enters Lake Michigan, you will find Manistee. This historic town is loaded with museums. Great fishing is found in the river and of course Lake Michigan. Several charter boatscall this their home port. 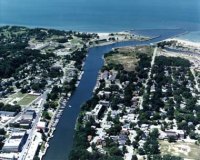 This is rated one of the top 5 Northern Michigan beachtowns in Michigan. Some ofthe best beaches in the state are found here. The state park located north of town offers great camping and fishing on Lake Michigan and Hamlin lake. Ludington is also home of the SS Badger. This car ferry makes daily trips to and from Manitouc Wisconsin. In between these towns ... you will find plenty of smaller villages and towns which all offer their own magical, romantic finds. Take the time to stop and explore them. They too are a part of this amazing northern area. Make some memories! 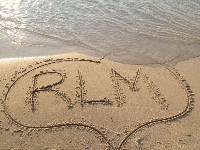 From Northern MIchigan Beachtowns back to Romantic Lake Michigan home.